Snoring vs Sleep Apnea - What Is The Difference? Is It The Same Thing? The most common question I usually get is “Is snoring the same as sleep apnea?” Before we talk about sleep apnea, we need to understand what it is first. In most cases, snoring is a precursor of sleep apnea. No snoring? Most likely you do not have sleep apnea. Some peoples’ intensity of snoring may be very loud, but are not actually causing any harm or danger to their bodies at all (except when their partners punch them during the night). As long the individual is breathing, and their lungs have constant access to sufficient amount of oxygen during the night, they are usually okay. We will eventually talk about how we know if there’s a lack of oxygen while sleeping. As we explained before, snoring comes from a slight obstruction in the airway, sometimes, people snore too much and eventually their airways are fully obstructed. An “apnea” or sometimes spelt “apnoea” (depending on where you are in the world), by definition means one episode of “stop breathing”. When a person stops breathing continuously for 10 seconds, this is counted as one “apnea”, the amount of times you have apnea episodes per hour determines how severe your level of sleep apnea is, we will discuss more on these later. Now that we have understood what an apnea is, let talk about how to know if someone has it. Now, there must be a reason why you’re reading this. Perhaps you suspect you may have sleep apnea, or you are worried about someone you love may have it, or you are just a student on this website doing some research for your school project. For whatever reason you’re reading this for, there is no harm in educating yourself on what to look out for. Indications such as tiredness during the day, or feeling groggy in the morning, might actually be a first sign of sleep apnea. There is a simple test that you could do at home, it’s called the ESS test (Epworth Sleepiness Score). In a car while stopped in traffic. Now add all the numbers up, and that will be your Epworth Sleepiness Score. If you obtained a score of less than 10, most likely you are getting enough quality sleep. If you scored between 10-16, you are suffering from excessive daytime tiredness, if you scored 16 and above, definitely see your doctor, as this is definitely not normal, in other words, you are dangerously sleepy. The ESS is a rough test to give you an idea of where you stand in terms of sleepiness. This test does not determine if you have sleep apnea or not. Well, it’s very important to be aware of how you sleep at night, because depending on the severity of your apnea, it may have drastic consequences on your body, health, and mindset. You are probably very shocked right now to see that whole list of symptoms sleep apnea can cause. However, it is actually very easy to understand why. Basically, with sleep apnea, you are pretty much deprived of oxygen. With a lack of oxygen, comes with a lot of consequences. 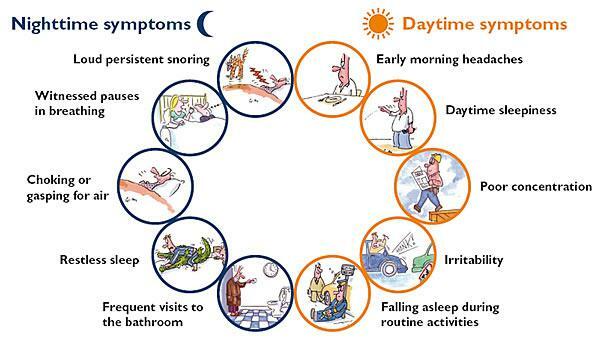 The main and very obvious symptom is tiredness, why do you feel tired you may ask? Think about this, when you stop breathing, your body will go into a self defence mode that is also known as the “fight or flight response”. Your heart will then pump a little bit harder and faster to compensate for the oxygen lost, so essentially if you think about it, you are doing “exercise” in bed, constantly overworking your heart during the night, resulting in you waking up groggy and tired, moody all day, ruining your work efficiency, and since you’re overworking your heart constantly during the night, if untreated in the long run, it could unfortunately lead to diseases such as high blood pressure (hypertension), heart attack, or even stroke. It’s actually a vicious cycle. Constantly being deprived of good quality sleep, and if this cycle continues on for a long time, you will accumulate what we call a “sleep debt”. ​Sleep debt? What is it? Sleep debt is the cumulative effect of not getting enough sleep. To understand sleep debt, I like to compare it to real money. You can take out a loan and have a debt against the bank, you can also have less or low quality sleep time and create a sleep debt too. Fortunately, sleep debt is way easier to pay off than real money. With the proper recovery and treatment, you can pay off your sleep debt in as soon as a month. The amount of time we need to sleep for varies from person to person. It’s very simple to calculate how much sleep debt you have accumulated, and each person’s calculation varies too. For example, you are a teenager, and your goal is to sleep for 8 hours every night. Instead of going to bed, you decided to stay up until midnight playing video games, knowing you have to wake up at 7:00 am to get ready for school. Which means every week, you will accumulate one hour of sleep debt, and over a five-day week, the amount of debt increases to 5 hours. You may think sleeping for an extra 5 hours on the weekend would help pay it back, but it does not necessarily work that way – Snooze marathon does not work, but taking on an extra hour a night is the way to catch up. For the chronically sleep deprived, take it easy for a few months to get back into your natural sleeping pattern. In saying that, why do some people still feel tired even though they get enough sleep? This is when we do a more extensive test to find out the real reason behind daytime sleepiness.